“A Night of Shakespeare Shorts” is a celebration of short scenes from the plays of William Shakespeare in the spirit of a competition at the iconic Phoenix Theater, 201 E. Washington Street, Petaluma, CA where Harry Houdini, Enrico Caruso, Red Hot Chili Peppers, Huey Lewis and Santana have performed! A variety of short scenes from Shakespeare’s plays interspersed with music by local musicians will be performed by a variety of participants. Scenes will be adjudicated by a panel of Shakespeare savvy judges and participants have the chance to win $500 for Best Scene of the evening, Best Dramatic Scene $100 and Best Comedic Scene $100. 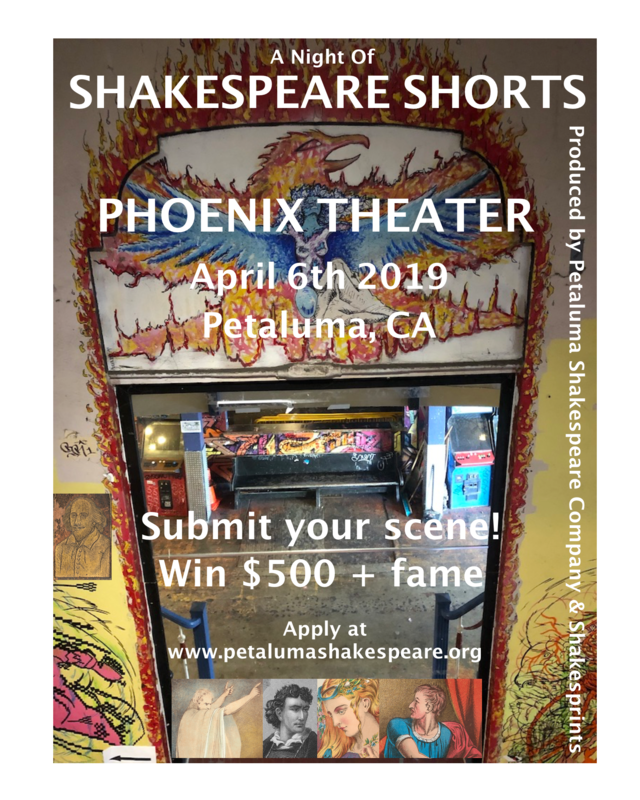 Shakespeare Shorts is hosted by The Petaluma Shakespeare Company, Shakesprints and The Phoenix Theater on Saturday April 6, 2019. Doors open at 7:30 p.m. Performance at 8:00 pm. Tickets $10 General/ $5 Students. All tickets include a slice of birthday cake. It’s early but we have to celebrate William’s birthday when we can!